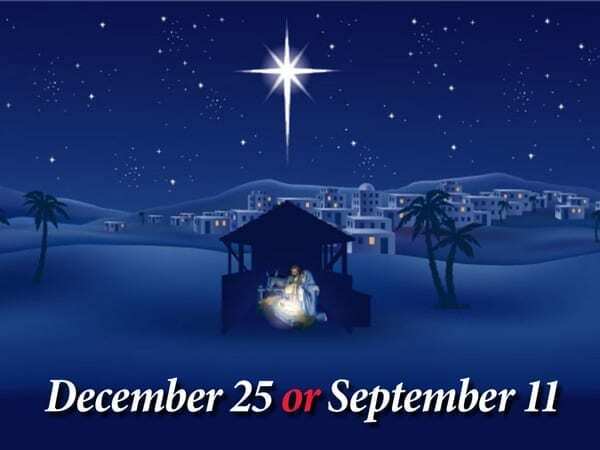 FAQ: I have heard a number of people say that Jesus Christ was not born on December 25th, the date that Christians celebrate as his birthday. Is that true? If not, why do people celebrate on that date and when was he born? “Merry Christmas!” Centuries old, those cheery words are still being spoken each December by countless millions of people, some of whom do not even believe in Jesus Christ as the Son of God or the resurrected Lord. As we write, the world is once again approaching “the Holiday Season,” when the name of Jesus Christ takes center stage for a few weeks. Amidst the often-crass commercialism of Christmas, familiar carols and Christmas cards do herald the glad tidings of the baby born to be the Savior of mankind. And in perhaps unwitting concurrence with our heavenly Father’s unparalleled act of giving His only begotten Son, even non-Christian families gather together in love and give gifts to one another. For many people, “Christmas” is their favorite time of year. We in The Living Truth Fellowship are glad that the birth of our Lord Jesus Christ is recognized on the calendar each year. However, much of the beauty of the events leading up to and including the birth of Jesus as told in the Word of God has been obscured by the religious traditions of men. In this brief answer to the above question, we hope to whet your appetite to look deeper into these magnificent truths, including the poignant and inspiring examples of those players in this real life drama that forever changed the world. For specific astronomical documentation of the birth date of Christ, see the book titled, The Star That Astonished the World, by Ernest L. Martin. We believe that when all the evidence is considered, it shows that Jesus Christ was not born in December, but in September of 3 B.C. Think for a moment about the significance of a birthday, say, your birthday. Since the dawn of time, what happened on the day you were born had never happened before and will never happen again. You, the only you who will ever draw breath, came into existence with a “clean slate” set before you on which to write the story of your absolutely unique life. And so it is for every human being ever born, including The Man whose sinless life earned him his current position of “Lord” at the right hand of God, His Father. Knowing that Jesus was His only hope for the restoration of His shattered dream of a family living forever on a perfect earth, God, the Father, announced the impending birth of His only begotten Son in Genesis 3:15. He told the Devil that the “offspring” of a woman would one day crush his head. For the next 4000 years God precisely and meticulously worked to establish and preserve the bloodline from which the Redeemer of man would be born. Throughout the Old Testament, Satan tried in vain to destroy this bloodline, sometimes coming within a hairsbreadth of succeeding, but God was always one step ahead of him; and at last, the cries of a newborn baby in a manger split the air in Bethlehem. The Promised Seed had arrived! The Plan of Redemption was proceeding toward Paradise regained. Biblically speaking, the answer is (e). Babies cry. The other answer choices point to the traditions of men that have made their way into the beautiful account of the birth of the Savior of the world. Tradition would have us believe that Jesus was born on December 25th, when it is very cold and sometimes snowy in Bethlehem. The truth is that Jesus was born in September. Tradition would have us believe that there were three wise men and that they came to the manger. The truth is that there were quite a number of those who came from the East and that they came to see Jesus when he was between 18 and 24 months old. In this brief article, we cannot fully set forth the many pertinent biblical details, but we will give you the important facts and we encourage you to pursue this via the avenue of study mentioned above. It is important to note that the actual chronology of events regarding the birth of Christ must be put together from what is recorded in Matthew and Luke (with some overlapping in time) as follows: Luke 1:5–25, 1:26–38, 1:39–56, 1:57–80; Matthew 1:18–24, 1:25a; Luke 2:1–20; Matthew 1:25b; Luke 2:21, 2:22–24, 2:25–35, 2:36–38; Matthew 2:1–12, 2:13–22, 2:23; Luke 2:39, 2:40, 2:41–50, 2:51 and 52. Luke 1:5–25 is the record of the angel’s announcement to Zechariah that he and his wife, Elizabeth, would have a son, whom they were to call John. Verse 5 contains a little phrase that is one important key to determining that Jesus was born in September not December. It says that Zechariah “…belonged to the priestly division [KJV: “course”] of Abijah.” A study will show that from the time of David, Jewish priests were organized into 24 “courses,” named after the heads of the priestly families. These courses of service in the Temple started on Nisan 1 (which corresponds to March or April on our calendar) and spanned the calendar year. Because the Hebrews used a lunar calendar and we use a solar calendar, Nisan 1 changes on our calendar each year. The course of Abijah was the eighth course and, like each course, occurred twice during the year. In 4 B.C., the year prior to Christ’s birth, the first of those two courses took place during the last week of our month of May. Zechariah and Elizabeth were quite elderly and had no children, and the angel gave them the wonderful news that they would have a son, to be named John. Verses 23 and 24 tell us that when Zechariah finished his service in the Temple, he returned home (which would have been in early June). Upon his return, Elizabeth became pregnant. Verse 26 then says that in her sixth month of pregnancy (December), the angel Gabriel came to Mary to tell her that she was about to become pregnant with the Son of God. Nine months later would have been September. How else do we know that Jesus was not born in the Winter? Luke 2:8 speaks about the shepherds near Bethlehem who were in the fields watching their flocks at night. Shepherds in that region did not keep their sheep out at night during the Winter because it was cold and sometimes even snowy, but they did keep them in the fields during the Fall, after the end-of-Summer harvest. At that time, the sheep could eat the stalks of grain left over after the harvest and they would then fertilize the ground prior to the late Fall planting. Also, Luke 2:1 says that when Mary was just about to give birth to Jesus, she and Joseph traveled to Bethlehem to fulfill their obligation to be counted in a Roman census. They did not travel in the Winter because it would have been much too hard. Rather, people traveled in the Fall, between the heat of Summer and the cold of Winter. And at that time of year the grain, and also some fruit, were ripe and travelers were allowed to eat some of the “gleanings” as they passed by (Lev. 23:22). What about the “three wise men”? First, the Bible never says there were three. It says that they brought three gifts: “gold, frankincense, and myrrh.” In that time, three men with such precious treasure traveling such a great distance, some of it through the land of their country’s enemies, would have been easy prey for enemy soldiers or the many robbers who prowled the roads. It is therefore almost certain that they would have traveled in a much larger group with adequate protection. Who were those men who took note of the many astronomical phenomena heralding the birth of Christ in Judea and then traveled to find him, arriving when he was about 18 months old? Scripture calls them “Magi,” and they were scholarly men from Persia well versed in astronomy, history, and religion. It is most significant that their ancestors were those over whom King Nebuchadnezzar had appointed Daniel in what was then called Babylon (Dan. 2:48 and 5:11 says he was appointed “master of the magicians [Magi]”). That explains why Herod, who had consulted with the Magi as to the time when they saw the star (Matt. 2:7), determined to kill all the Israeli boys under two years old. He knew that Jesus was no longer an infant and set two years as a safe limit to how old he would have been, which we believe was about 18 months. We believe that the evidence shows that Jesus Christ was born in September, 3 B.C., and that the local shepherds were the only ones who came to see him at the manger. It is significant that in that culture, shepherds were generally considered extremely faithful and trustworthy men, and certainly those particular ones were because they immediately acted on what the angel told them; and after they had found the Savior, they “spread the word” concerning what the angel had told them. You might want to take a moment, put yourself in their place, and let the magnitude of their experience sink into your heart. It is safe to say that the two primary heroes in this scintillating saga were a man and woman (probably in her mid-to-late teens) who suddenly found themselves thrust into starring roles on the stage of history. Think first about Mary, a young Hebrew woman chosen by God to bear His Son. Words fail to adequately describe what it must have been like for her when the angel of the Lord appeared to her and made his amazing announcement. She fearlessly asked the angel a very good question, which did not imply doubt, but was simply a request for more information. And when she got the answer, she uttered one of the most faith-filled statements ever spoken: “…Behold the handmaid of the Lord. Be it unto me according to your word….” What a woman! And think about Joseph, who discovered that his beloved bride was pregnant. How heartrending, and what a man of character he was; first, not to make public their situation and then to endure the public ridicule he must have gotten as the father of an illegitimate child. Imagine, as Joseph wrestled with this incredibly weighty issue, how his heart must have leapt for joy when the angel told him that the woman he had chosen as his wife and the mother of his children was also the woman God had chosen to be the mother of His Son. And think of his love for her and his steadfast discipline not to sexually consummate their union until after she had given birth to Jesus (Matt. 1:25). Joseph was a man’s man and a true hero of the faith. No, we are not advocating a worldwide campaign to change the celebration we know as “Christmas” from December 25th to September 11th, which has already become a most significant date here in the USA. But we ourselves do at least pause on that latter date to thank God for His Son and to thank the Lord for living and dying for us. Nor are we suggesting that you take it upon yourself to re-arrange the manger scene in your town square by kidnapping the three wise men. And we do not believe it is a sin to have a Christmas tree, 200,000 lights on your house, stockings hung by the chimney with care, etc. Just don’t worship the tree.